The Bender Bunch: Data Collection Simplified! 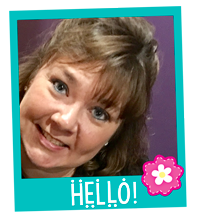 Today I'm here to talk about how I've simplified and found the perfect academic and IEP goal data collection system for my classroom. Data collection! Such a struggle right? We're always looking for ways to simplify it and make it doable! We try this and we try that. It always seems unmanageable! Well last summer I perfected my academic/IEP data collection system and I can finally cross it off my to-do list for GOOD!! My year ran so smoothly with this system last year and my data was so thorough, timely, and organized. I started with a 2 1/2 inch binder! I kept all of my students' academic/IEP goal data in this one binder. If you're wondering, I separate behavior. My students with behavioral goals have separate behavior binders, as there is so much more data involved for behavior. This post strictly focuses on academic data collection. Here's a peek at the inside of the binder. I love these pocket dividers! They are vinyl and very durable. I labeled a pocket divider for each of my students. 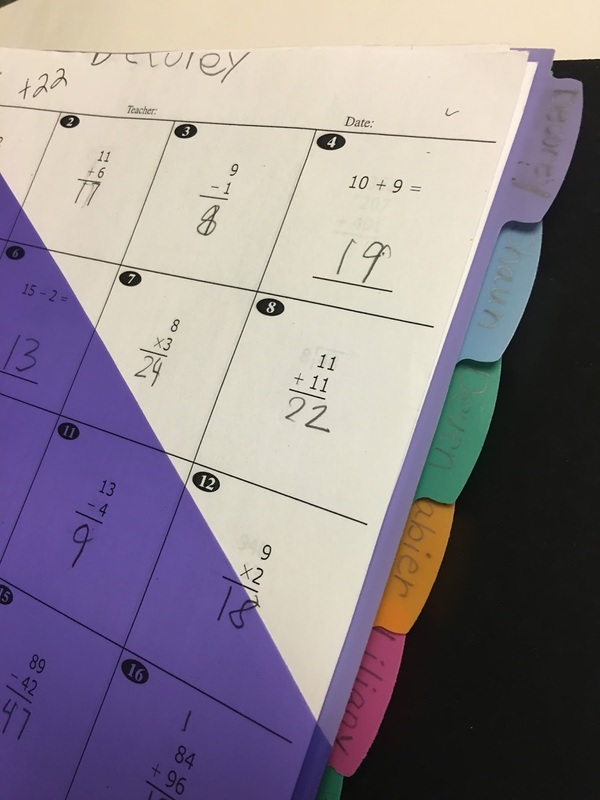 I label them in pencil so that I can easily reuse them year after year! I use the pockets to store their test items and work samples for easy access! Everything else is 3-hole punched and placed behind their pocket. 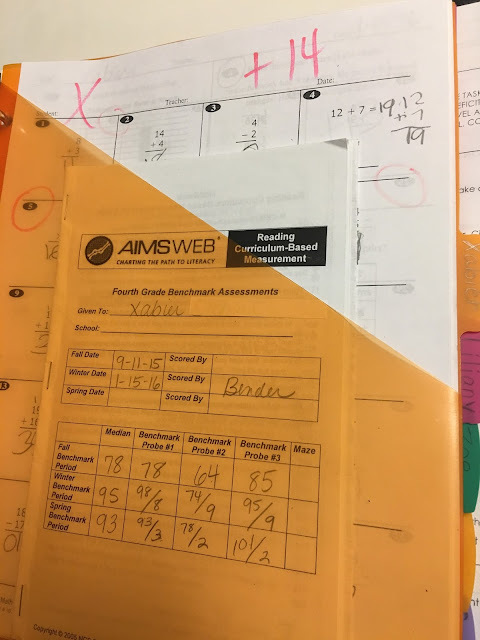 I use AIMS web to progress monitor my students academic goals whenever possible. 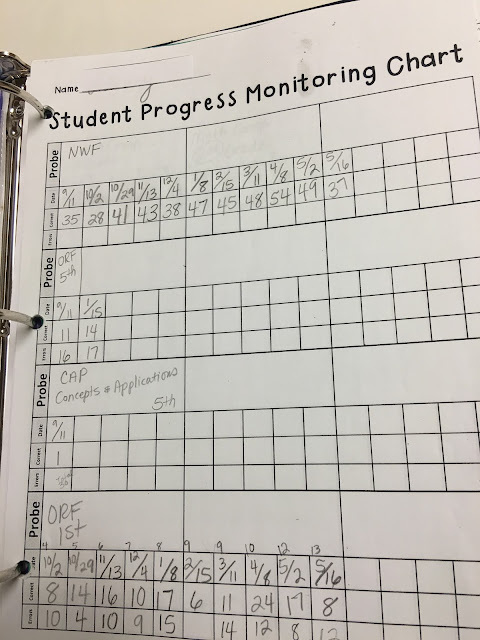 They have so many progress monitoring tools available that even my lowest students working on letter recognition and basic number recognition can be progress monitored and assessed with AIMS Web. 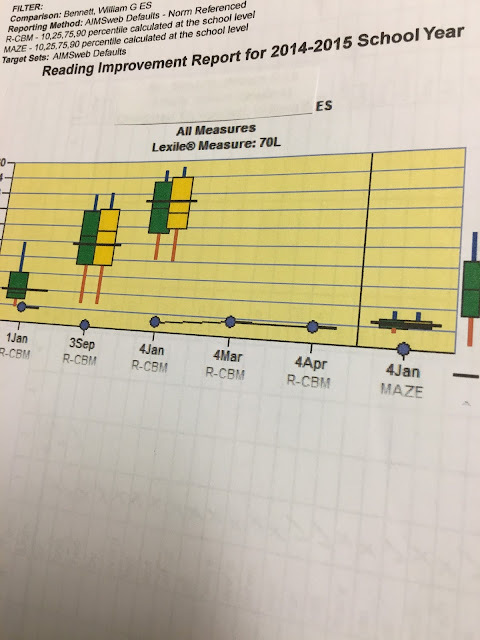 It's easy and reports and graphs are so easy to print! Fortunately, my district provides AIMS Web. 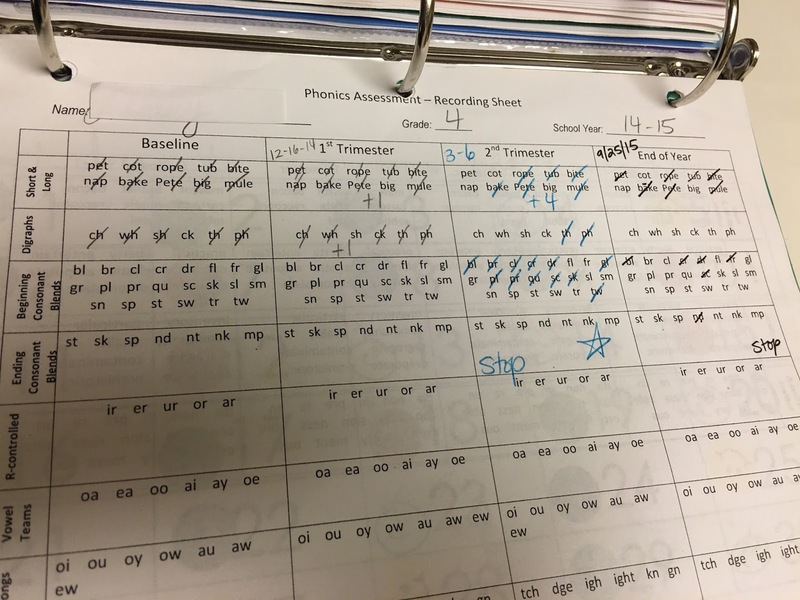 It is largely used across the states by numerous school districts for progress monitoring and accountability; however it seems few special education teachers use it. If your district has it, I highly recommend using it. If your school doesn't use AIMS Web, they may use DIBELS. This program is very similar to AIMS Web. Either way, check to see what your school uses and take advantage of it. Here's a peek behind a student's pocket. Each student's may look differently depending on what skills they are working on. This is the first page for every student. I always include a blank sheet of paper as the first page. This is where I put notes of things I see they need to work on, or where I can quickly jot down those ah-ha moments that hit me about that student! This is the second sheet in the binder for students being monitored using AIMS Web. 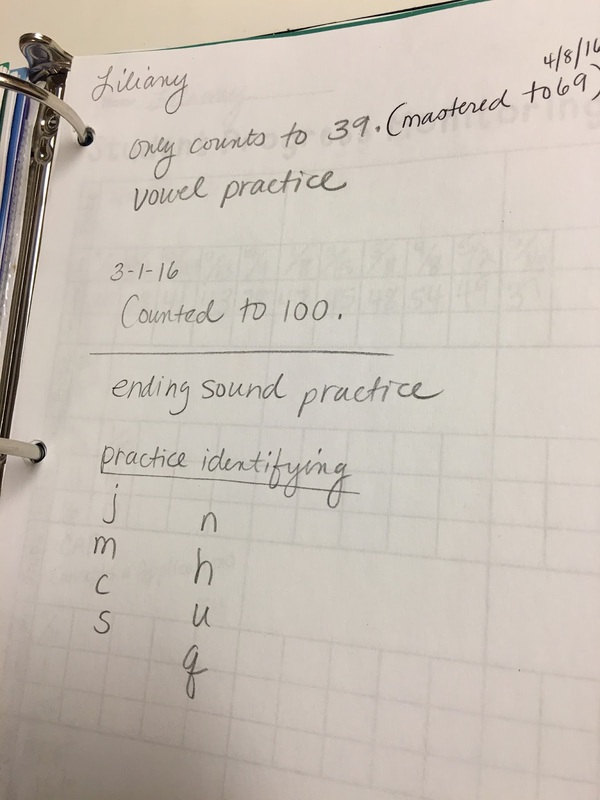 This student has a goal of reading CVC words, so I am progress monitoring her on NWF (Nonsense Word Fluency) and ORF (Oral Reading Fluency). AIMS Web also offers basic math computation assessments. This is a 5th grader that I was assessing using first grade probes. She mastered 1st grade and then moved on to 2nd grade. I love that it provides a running record that is easy to view progress. My students also have open access to this binder so that they can see their scores. They look at their scores before each assessment and try to beat their score!!! Each time they do we make a big deal of it! We shout it out in the class and everyone applause's. I give my student a little something for increasing, like a hershey kiss or a starburst. 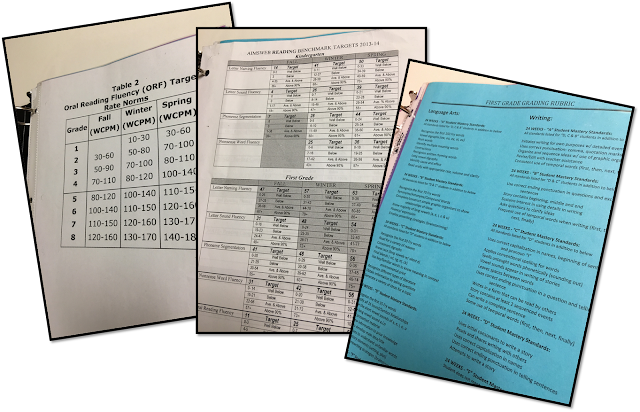 I print the reports I need each quarter or prior to an IEP meeting or conference, 3-hole punch them and stick them in the binder. My students that can read also have this assessment behind their tab. This is the San Diego Quick Reading Assessment. 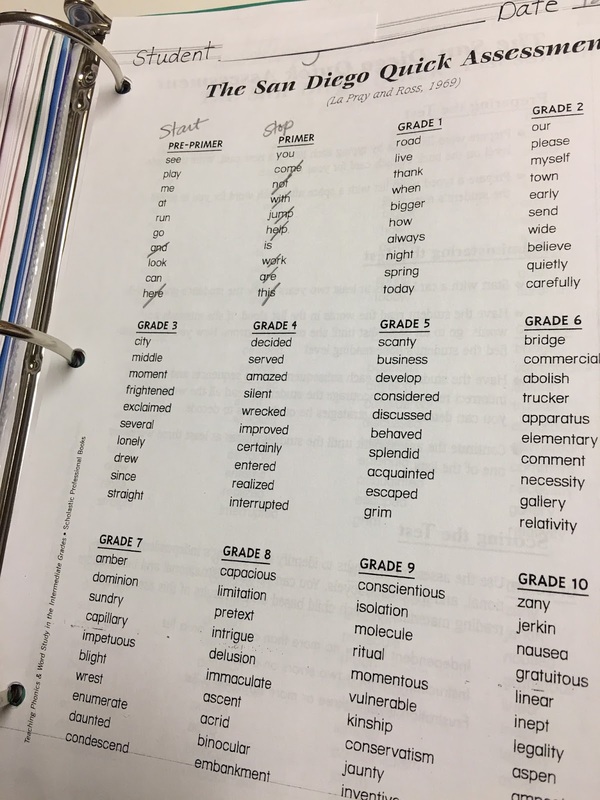 I love this reading assessment. It can be administered in less than 5 minutes and is SOOOO accurate in assessing a student's reading level. You can access it here. For readers, the third page is always this. This is my phonics quick screener. It clearly identifies what level students are at in their phonics skills, where they need remediation at, and where lessons should start. 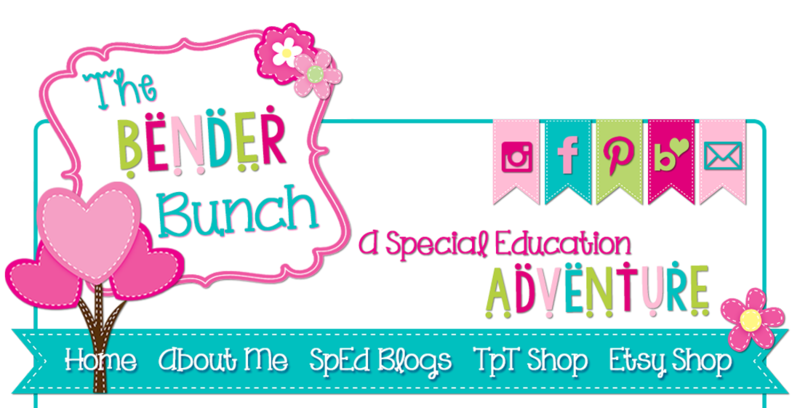 You can get the phonics screener here. 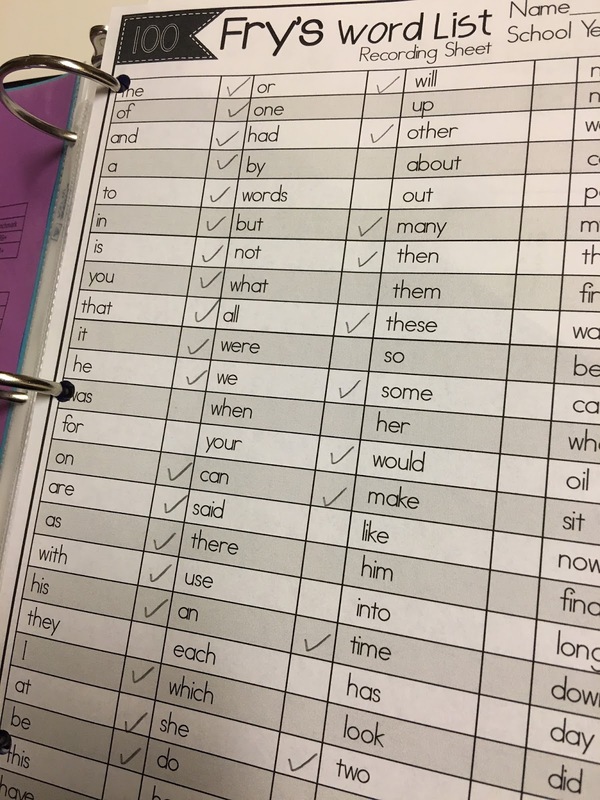 It also includes their Fry's Word List Recording Sheet, as we practice these daily. You can see our Fry's Word Lists and get access to this sheet here. 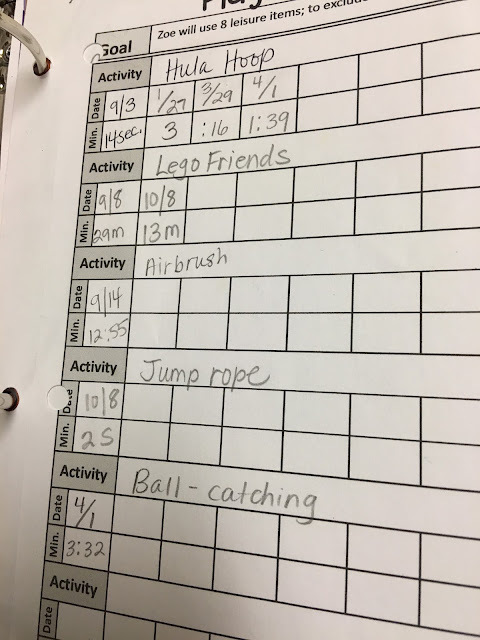 Some students will have different sheets, such as this student that is working on play skills. Here are the sheets I use to track IEP goals in my classroom that I can't use AIMS Web for. I like to track goals using trials when the goal allows for it, as it is much easier to track. Some goals require a percentage criteria. You can still use this sheet to track those goals. So for example, if a student got 6 out of 10, that would be a 60% achievement. For students that have a mastery criteria of 5 trials, I use a sheet with only 5 trials listed. The goal tracking sheets allow for 6 goals so you can keep each student's goals on one page for simple organization. I rarely have a student with more than 6 goals. I typically stick with one goal for each area. This keeps it manageable. So when do I fit all of this in!? Simple! I collect academic/IEP goal data every Friday, but each student is every other week. So for example, I'll do half of my students this Friday, then the other half the next Friday. I decided to stop wasting my time trying to collect IEP goal data daily or every few days. Let's face it, most of our students do not make progress at that rapid of a pace. 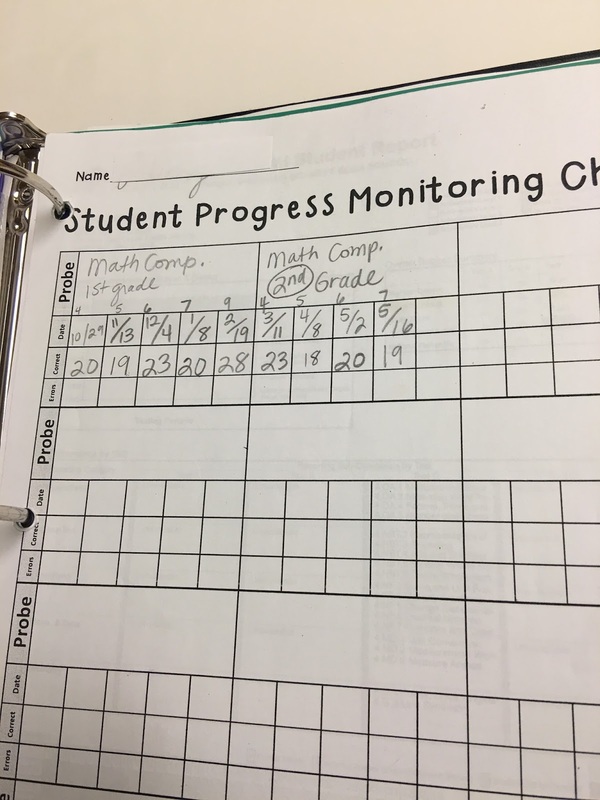 So in order to see growth for my students and simplify my data collection system, I assess (progress monitor) my students every two weeks. One of our classroom centers is "Teacher Table" where I do direct, explicit teaching Monday through Thursday. On Fridays, "Teacher Table" is cancelled and I call students back one at a time to do my assessing. Rather than my students coming to their "Teacher Table" center on Friday, they go on iPads or computers during this center while I assess. My school is on a quarter system, so there are approximately 9 weeks in a quarter. So if I assess my students every two weeks, for example, on week 2, week 4, week 6, and week 8, this allows me to have a good amount of data by the end of each quarter. Lastly, I can't forget the front of the binder. In the front of my binder I keep my benchmark targets, norm charts, standards, etc. in sheet protectors so I can easily refer to them when I need them. And that's it! My data system simplified! One binder, some pocket tabs, a few simple recording sheets, and you too can simplify and organize your data to make it manageable. I'm at school to work with kids, not take data all day! Stop letting your data consume you and take the fun out of teaching! Remember you don't have to take data every.single.day and on every.single.thing!! 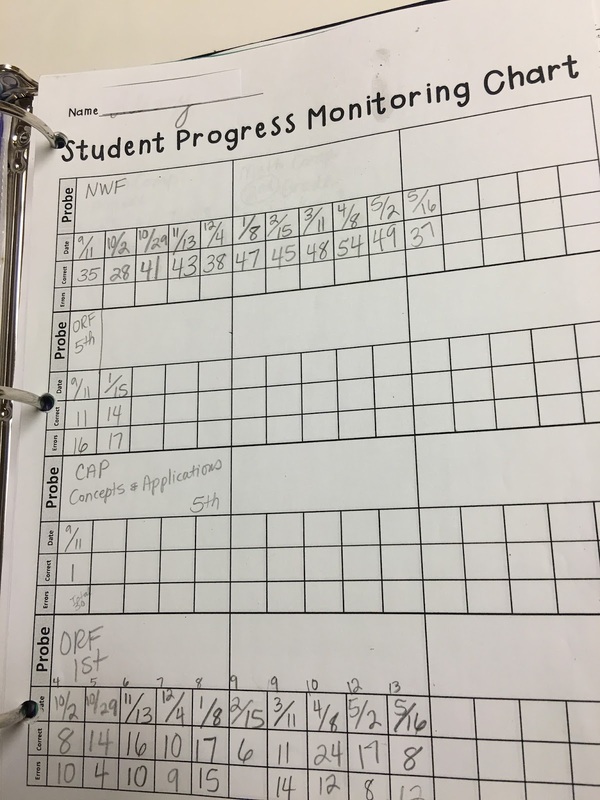 Grab the student progress monitoring and goal tracking sheets here for free and start simplifying your system! 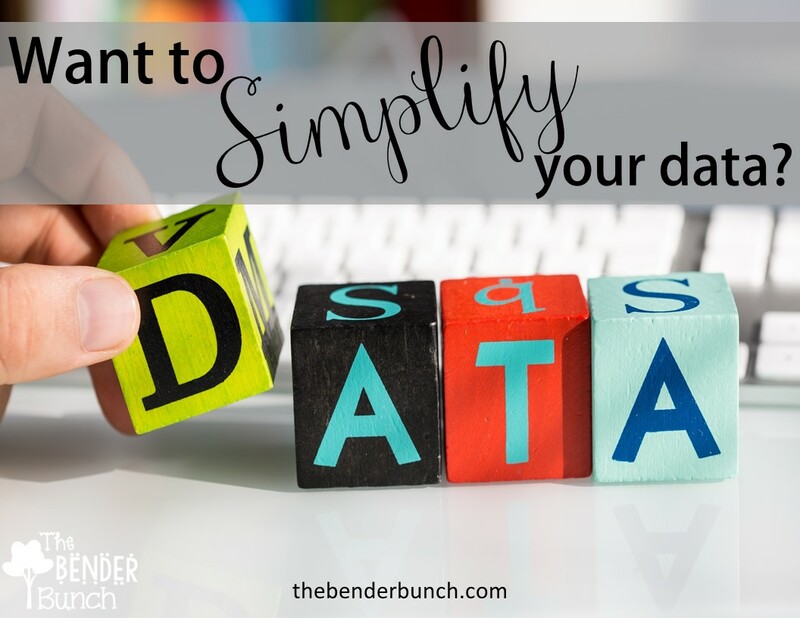 If you're in need of more support on simplifying and managing behavioral data, check out this post. 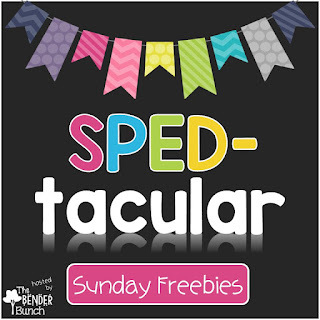 Stop back tomorrow for some SPEDtacular Freebies! I love your system! I'm a new special ed teacher and I am always glad to read about ideas that work well. I may be odd because I sort of enjoy collecting data. I am also odd because I hate the word "probe!" I'd rather call it just about anything. HaHa, I know, it does sound weird doesn't it! I think I only used it once...ok maybe twice! In SPED, we typically use protocol, but AIMS does refer to it as a probe. Best information on data collection I have ever seen! You are a lifesaver! Thank you so much!! Great ideas! I love how simplified, yet efficient your system is. Looks like I am adding a few supplies to my shopping list! Where do you get your benchmarks and norms sheets from? They are available on the AIMSweb site. This post is LIFE! Thank you for sharing! Please keep to info coming. You are a lifesaver! 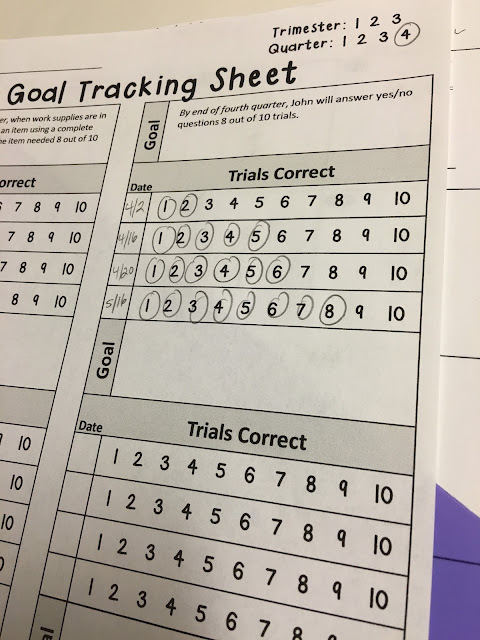 Do you have the Goal Tracking Sheet available for download? Loved the layout of it and making my binder as I type! The link is above. 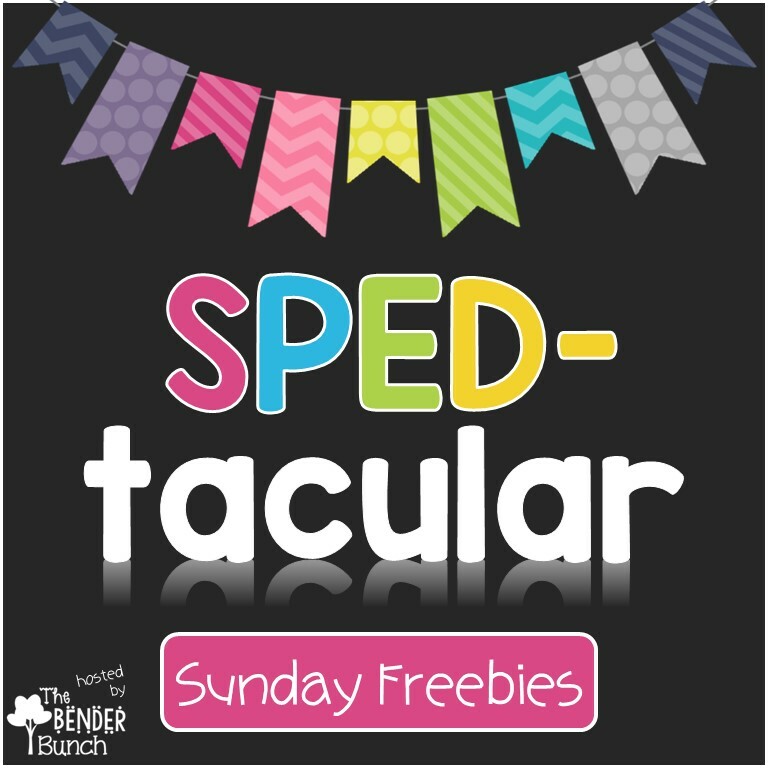 It's the third paragraph above the SPEDtacular freebie picture! sweet thanks! I must have missed it!